The latest findings on how chimpanzees behave and think have -once again- shown that these primates could well be called the “cousins” of human beings. They not only laugh like us, but also smile in silence; they are gourmands, they play, they are aware of the fact that they think and can distinguish between fair and unfair, as well as cultivating friendship. Children are not the only ones who spend hours playing and having fun. Chimpanzees spend many hours playing —which ethologists, the behavioral scientists, have defined as any activity that produces no clear or immediate benefits—, both during their childhood and their “youth”. 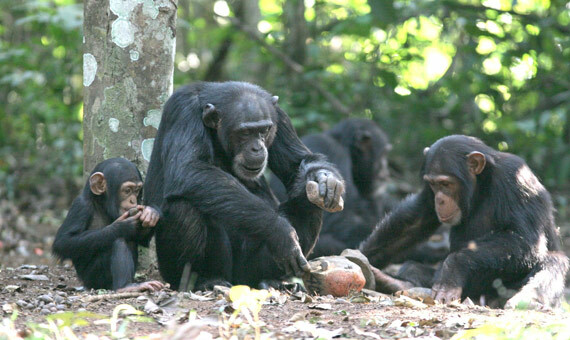 Scientists at the University of Pisa (Italy) have demonstrated that social games, that is, those which are not played alone but with other chimpanzees, help them build strong social relationships and develop cooperative attitudes. And as in humans, game modes and playmates change as primates grow up. Among other things, games are more cooperative in early childhood, becoming more competitive as young primates grow older. These primates can smile in silence, laugh out loud or burst out laughing, a range and flexibility in communicating positive emotions that until now was thought to be a unique human feature. Everything suggests that facial expressions linked to laughter were already present in our primate ancestors, appearing long before humans evolved. The only smile that for now seems unique to humans is the so-called Duchenne smile, a spontaneous expression that is recognizable by the involuntary contraction of the orbicularis oculi muscle —which surrounds the eyes—, whose contraction raises the cheeks and forms wrinkles or “crow’s feet “around the eyes. This is the true and genuine smile and is linked to the activation of the brain’s limbic system -where emotions are generated-, as demonstrated years ago by French neurologist Guillaume Duchenne. As they have no access to supermarkets or restaurants, chimpanzees are willing to travel any distance to find their favorite ingredients in order to prepare a succulent feast. This was the conclusion reached recently by scientists from Harvard University (USA), also demonstrating that chimpanzees share with humans a preference for cooked rather than raw food, as well as the ability to understand the transformation processes that occur when cooking food. Between the taste of a cooked potato and that of a raw one, primates opt without hesitation for the former. The only thing lacking for them to be considered chefs, researchers say, is controlling fire. Yet if they are given a heated pot or pan, experiments show that they learn immediately how to put it into use. 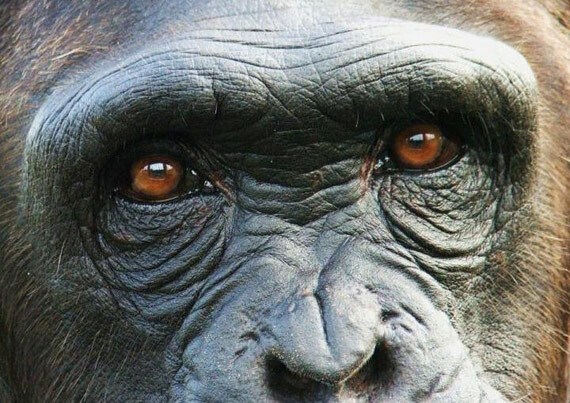 Chimpanzees have meta-cognition, that is, they are able to reflect on their own thoughts and mental processes, as demonstrated recently by researchers from several US universities in Cognition, the science journal. According to the authors, these primates are aware of what they do and do not know, and based on that they are able to display more or less confidence in their responses and behave accordingly, thus enabling them to make intelligent decisions. The sense of right and wrong is not unique to humans. Chimpanzees also discriminate in terms of deciding what behavior is inappropriate, especially when it affects young and baby chimpanzees. In a study carried out at the University of Zurich and which was published in the journal Human Nature, it became evident that if a chimp sees scenes of a baby being harmed or killed by another member of its own species, it reacts with indignation and anger, something which does not happen in cases of violence among adult monkeys. The study indicates that these primates have a sense of morality that is similar to that of humans. In addition, having played Ultimatum with chimpanzees –this is an experimental economics game that aims to show that choices regarding fairness and equality criteria take precedence over the benefits-, US biologists have demonstrated that these primates share our aversion to injustice. Specifically, chimpanzees tend to make fair and egalitarian offers, and only accept these kinds of offers from their peers. “For chimpanzees -who are very cooperative in the wild-, being sensitive to the equal distribution of rewards represents an evolutionary advantage because cooperation benefits them“, say the authors of the research. If you think that humans outperform chimpanzees in all cognitive functions, you are wrong. As it happens, the ability of a young (5 year-old) chimpanzee to remember the numbers displayed on a screen is considerably higher than that of an adult human, according to an experiment conducted at the University of Kyoto (Japan). Scientists attribute this to an equivalent of eidetic or photographic memory, that is, the ability to recall in detail what is seen or heard, which is present in human children and which declines with age. Of all the world’s species, humans and chimpanzees are among the only ones who participate in coordinated attacks on other members of their own species. In other words, both species are able to deliberately provoke a war. And in the case of primates, attacks are not caused by interference with humans, which was for some time wrongly thought to be the cause of the signs of aggressiveness displayed by these animals. What moves them to commit violent acts is in fact an adaptive strategy, as was recently concluded by thirty primatologists, based on the analysis of data gathered during five decades of research on conflicts involving chimpanzees. Attacks increase in denser populations and in those in which there is a greater number of males. And the victims are usually members of rival communities. The maxim that states “whoever finds a friend finds a treasure” also applies among chimpanzees. In case of any doubt, just ask Filippo Aureli, who —after a thorough study of the behavior of these primates— concluded that they live surrounded by good friends, that is, “not only unrelated individuals who spend time with them, but who also help them in cases of confrontation, sharing food and collaborating”. They even comfort one another and relieve other group members’ stress, as Aureli and colleagues demonstrated in a study published in PNAS. When choosing a friend, primates are selective. According to a study conducted by the University of Vienna, friendly relations are established between chimpanzees who share certain personality traits. 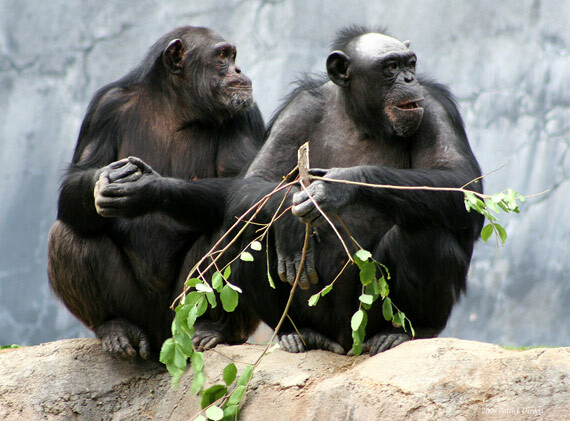 Specifically, the most sociable individuals get along with each other, while other shy chimpanzees seek other equally timid individuals in order to socialize. This resembles the “similarity effect” in humans, which is simply the tendency to have as friends those subjects who resemble ourselves.